What is a South Carolina Living Will? South Carolina Living Will: What Is It? A South Carolina living will is often referred to as a declaration. The purpose of a South Carolina living will is to list your wishes related to medical care. 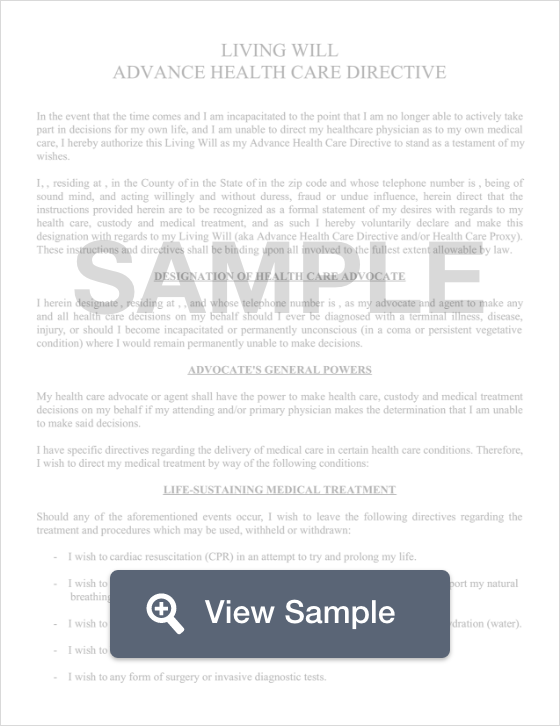 This document is consulted when you are not able to make your own medical decisions for any reason. A South Carolina living will also names an agent who will make your medical decisions during that time. A South Carolina living will must be signed by two witnesses and it must also be notarized. There are rules in South Carolina that determine who can and cannot sign as a witness. § 44-66-10 through § 44-66-80: The Adult Health Care Consent Act provides individuals who are at least 16 years old and competent with the right to create a written directive for healthcare decisions that may be used during a time when the individual cannot make their own decisions. Certain forms of healthcare may still be provided without the patient’s consent to relieve suffering, restore a bodily function, or to preserve the health, life, or body integrity of the patient. A living will is just one part of preparing for the end of life. It is equally important to prepare a South Carolina last will and testament.